Beat the egg whites till very light, put them in mounds on the platter on which they are to be served. Make with a spoon a hollow in the top of each mound, and in this put a whole egg yolk. Bake in a slow oven until the whites are a delicate brown, season with salt and pepper and bits of butter. Cut together before eating. When making angel cake, drop each yolk, as the eggs are broken, into boiling hot water, and set where they will cook gently until done. Make a white sauce of one and one-half tablespoonfuls of flour, one tablespoonful of butter, and one cup of milk. Season with salt and pepper, add one teaspoonful of chopped parsley (very fine), and pour over the well-cooked yolks. Serve with plain boiled or baked potatoes. This may be varied by using half as many mushrooms as egg yolks. Beat the yolks of two eggs until very light. 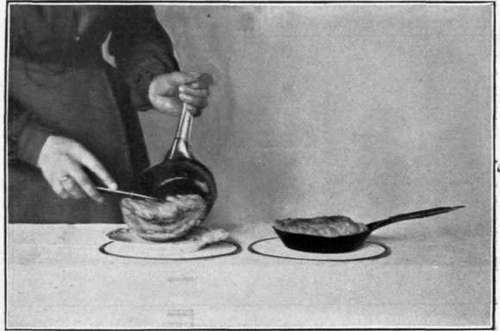 Then beat the whites, to which two tablespoonfuls of water, milk, or cream have been added, fold together, put in the greased omelet pan, let stand until set on the bottom, then put into the oven, and let remain until firm and lightly cooked to the center, which can be ascertained by trying with a knife. Cook in a very slow oven. This omelet is often used without a sauce. Equal parts of white of egg and whipped cream, sweetened and flavored. More cream than egg may be used. Nice for luncheon. A spoon is best for mixing white and cream. Strawberry juice may be used instead of cream. Two eggs, two tablespoonfuls of water (hot). Beat until the eggs can be lifted without running off the spoon. Heat one-half tablespoonful of clarified butter or bacon fat in an omelet pan, but be careful not to burn it. If any dressing is used, put in just before folding, except parsley, which put on when beginning to lift. Grated cheese may be used same as parsley, or it may be put on when turned. Manipulate same as cornstarch omelet. To the yolk of one large egg, beaten until very light, add one tablespoonful of fruit juice. If orange is used put in one-fourth of a teaspoonful of grated orange peel. 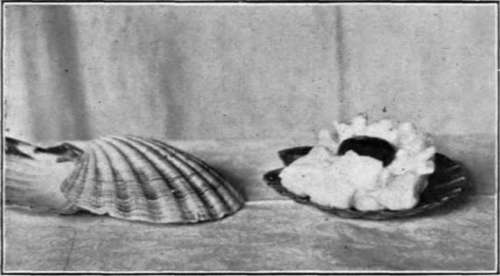 If peach is used, add one-fourth of a grated peach pit, and a very little cream of tartar in the whites before beating. If the fruit is unsweetened, add one teaspoonful of sugar, beat well together. Beat the white until very stiff, and fold in the beaten yolk. Cook very slowly in a well-greased omelet pan. Two eggs, whites and yolks beaten separately until very light. Add to the beaten yolks two tablespoonfuls of caramel, and beat together until well mixed; also two tea-spoonfuls of sugar, one-half teaspoonful of vanilla, and one teaspoonful of lemon. Fold this and the beaten whites together and cook slowly in the oven in a greased pan until done. Fold same as a light omelet.